"The citizens of the Town of Wakefield established the Wakefield Municipal Gas and Light Department in 1894. 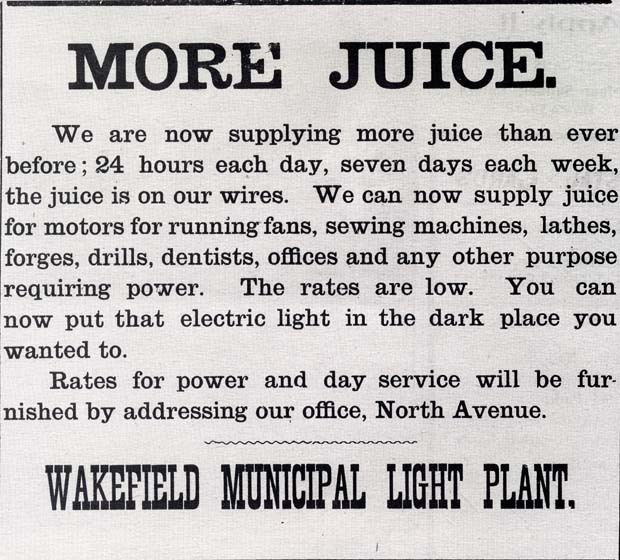 In 1905, the Wakefield Municipal Light Plant had 206 electric consumers, an increase of 16 over the previous year, and 834 gas consumers, a gain of 116 consumers. According to the Annual Report for the year ending January 31, 1906 sales of gas and electricity increased more during the year than any other year, and because of the increased demand, a decision was made to provide electric current during the day. Since the department was unable to generate a constant supply of current, a contract was signed with Malden Electric Company to install lines to the plant on North Avenue. From there, the extra 'juice' was distributed over the regular lines to the consumer." - Text from calendar by Jayne M. D'Donofrio. “Wakefield Municipal Light Plant, September 9, 1905,” NOBLE Digital Heritage, accessed April 22, 2019, https://digitalheritage.noblenet.org/noble/items/show/7151.